After 2 months of pretty raunchy morning sickness, I am back with a renewed energy for teaching Carter from home. To start with, the blog has a new look and feel to it. I hope that it makes activities easier to find and is more visually appealing. I’ve also made all the materials for each month accessible to Carter for the entire month, instead of one at time then gone. I couldn’t keep the materials we were using in his playroom for what I think are pretty obvious reasons, so I hijacked his black shelf and moved it to our dining room. 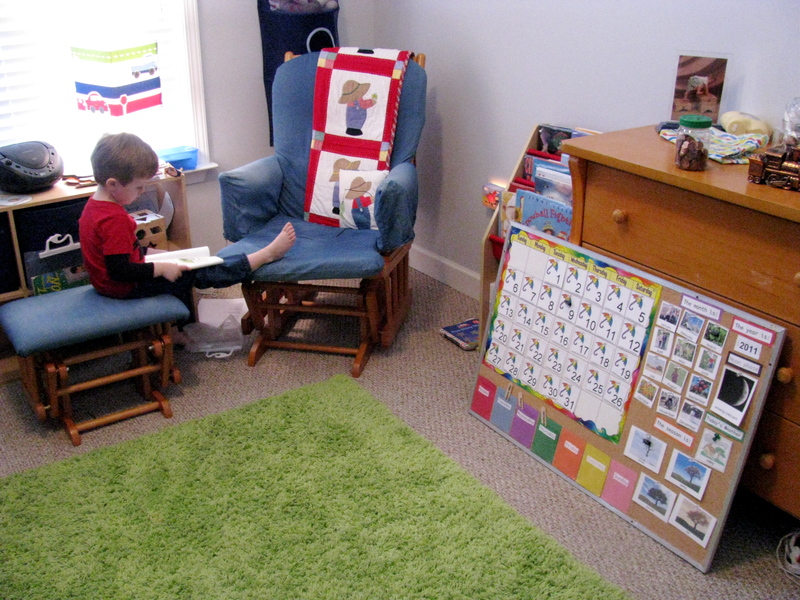 We aren’t fortunate enough to have an entire room to dedicate to making our own in-home Montessori school, so I’ve taken (and will continue to take) parts of our house over with school materials – in the most beautiful and organized way I can manage, of course. Yesterday we began to have Circle Time. 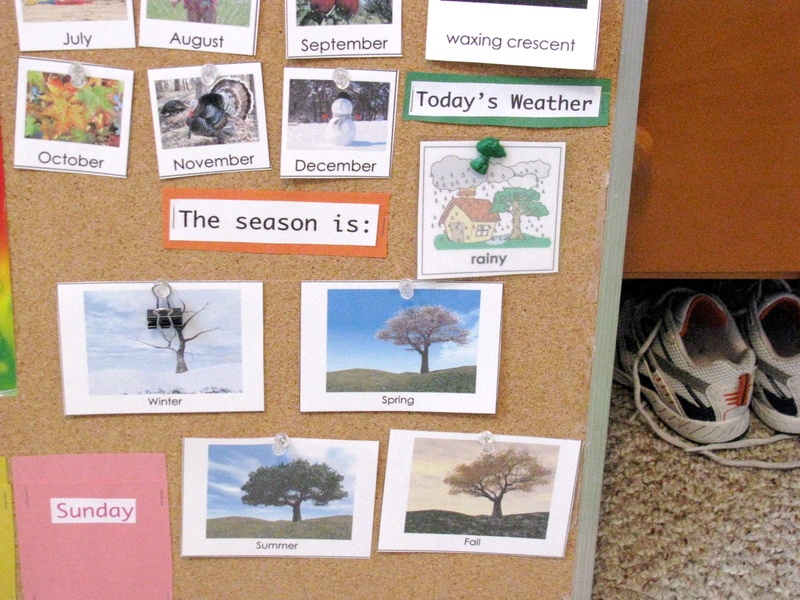 I got the idea to put all of our calendar materials on a cork board to make it portable. I’m able to store it in the living room so that I can be sure that it is treated nicely and then I can move it to Carter’s room for our morning Circle Time. I begin this time with the song It’s A Beautiful Day by Greg and Steve. I bought the blank calendar at Sta.ples because I had some reward dollars to use, but if you have a teacher’s supply store nearby they will have more choices. 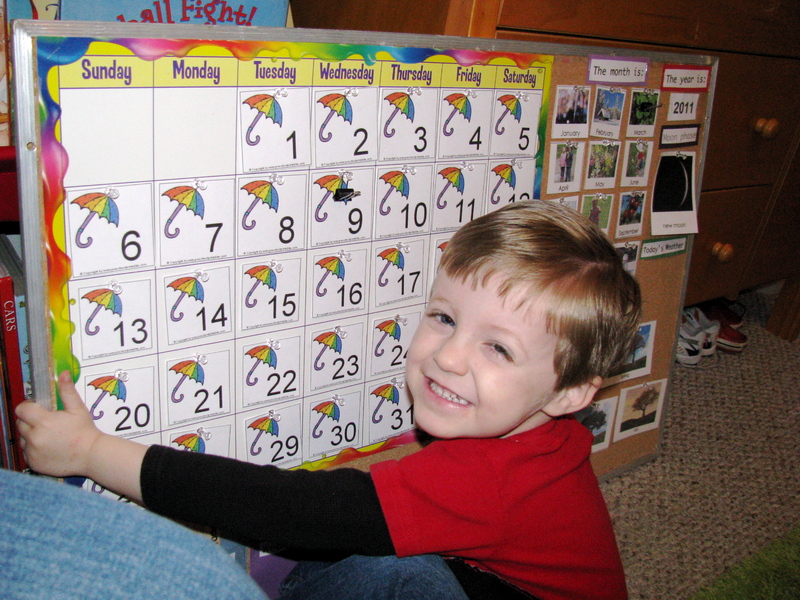 The calendar pieces can also be found already cut and laminated at a teacher’s supply store. You can also print them for free here. This site is where I found the umbrellas. Of course, even more free and just as effective are post it notes that you write your own numbers on. It may be difficult to see, but there is a clip on the number 9. I use that as our marker to keep up with which day we are on. 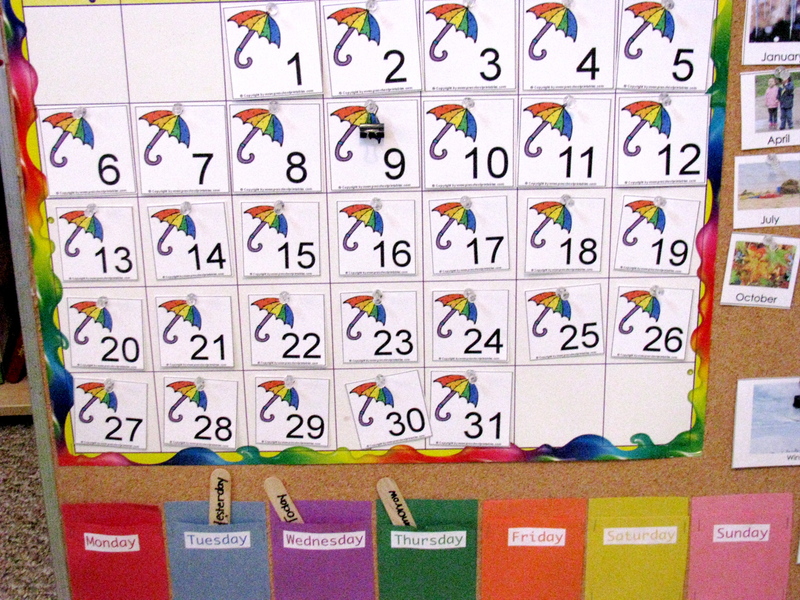 Below the calendar are Days of the Week pockets. I made those out of construction paper and printed/glued the names of the days on them, though you can purchase colorful pockets if you wish. In the pockets, there are 3 sticks that read: Yesterday, Today and Tomorrow. 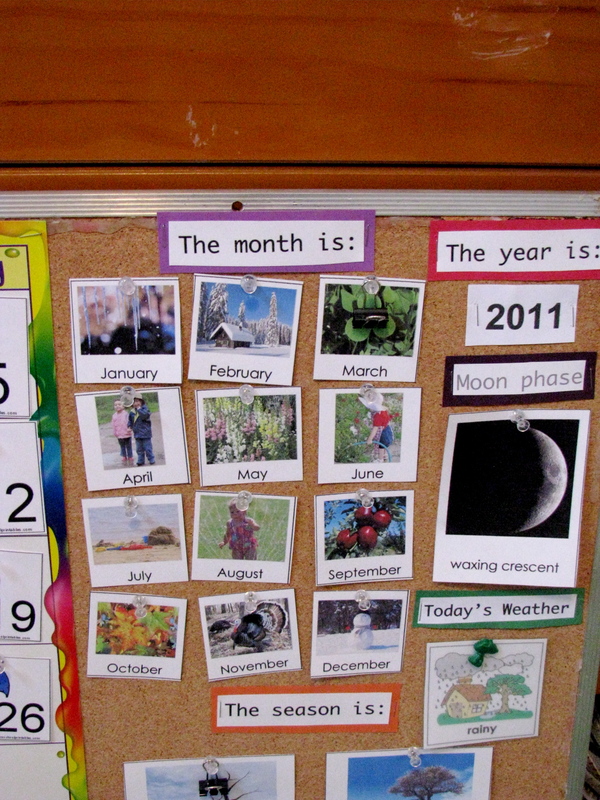 The month cards can be printed for free from Montessori for Everyone. They also have a great Calendar Activity Set that includes a lot of the things you’ll need to make your own calendar under “Free Downloads”. Carter has been fascinated with the moon from a very young age, so when I found these moon phase cards I knew that it would be something that would excite him. And, since I’m no astronomer, I found a month-by-month cheat sheet to know when to change the cards. I printed the weather cards from the Weather Unit on kidssoup. The beautiful season cards are also a freebie from Montessori for Everyone. After the calendar, we sing a fun song that gets us up and moving. Then, we close by Carter sitting in my lap and singing Special Me by Dr. Jean. This is a precious song that celebrates the wonder of your child. Enjoy and thank you for your comments! Glad you are feeling better! 🙂 Looking forward to more of your great ideas.